Asia House is a charity that aims to promote greater appreciation and understanding of Asian countries, their arts, religions and economies, and to foster closer communications between the people of Asia and Europe. Now in its third year, THE ASIA HOUSE FAIR 2012 is showcasing a selection of fine and innovative work from artisans, designers and master craftsmen from many Asian countries and regions including Turkey, Iran, Afghanistan, Pakistan, India, Bangladesh, Myanmar, Thailand, Vietnam, Indonesia, Japan, China and Central Asia. 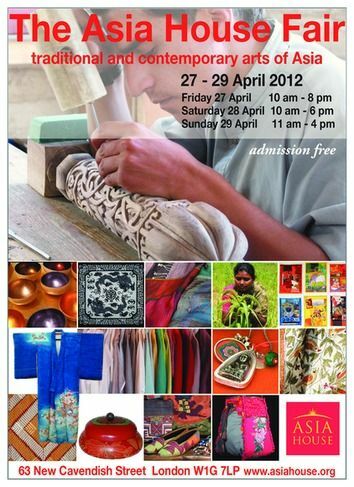 Exhibitors will be selling textiles, clothes and costume, jewellery, ceramics, handicrafts, paintings and works of art. The Asia House Fair is open: Friday 27 April 10am-8pm Saturday 28 April 10am-6pm Sunday 29 April 11am-4pm The Asia House Fair brings together specialists in the Arts and Crafts of Asia, including antique and contemporary textiles, cushions and quilts, traditional costume and clothes, shoes, shawls, jewellery - both traditional and modern, ceramics, lacquer, paintings, food and snacks, tea, magazines and music, The initiative of Sir Peter Wakefield, and therefore the aim of The Asia House Fair, is to promote exciting innovations in design and technique and the products of many cooperatives and craftspeople working in the area of ethical trade - rediscovering natural dyes and natural fibre and reviving ancient craft traditions for the benefit of loacl communities. New productions are exhibited next to the traditional and original that have inspired designers and given Asian art and craft enormous popularity in this country for centuries. Visitors to The Asia House Fair will find a busy and colourful marketplace full of wonderful products to touch, taste and buy in the charming setting of an 18th century building which is the home of Asia in central London.